Renn McWolfe's "Queen Darkara" is a brilliantly written fantasy novel for teens with an engaging plot and a fascinating world. The story follows the young, beautiful enchantress Queen Darkara after she is summoned to a distant land rife with death and destruction. 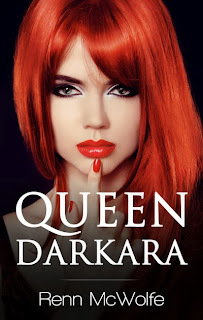 When Darkar learns that the land is being overtaken by a powerful, cunning witch, she agrees to do her best to hunt the witch, with a team of equally dedicated warriors, including the dashing, headstrong General Dominik the Brave. As engaging as the plot is, it is the writing that truly makes "Queen Darkara" shine. It is one of those books where you forget you are reading, and instead feel as though you are a transient observer in a far-off world. The well-developed characters and otherworldly creatures, such as the Trickster, a creature with a hunger for human hearts, feel tangible. The humor in the book adds a light-hearted element to the book, despite the somewhat dark plot. Unlike humor in many books aimed at teens, the humor does not feel forced; it feels like a natural part of the situations. Because of the writing, humor, and world, the cat-and-mouse game between Darkara and the evil witch is continually interesting, and the reader finds his or herself not wanting it to end. "Queen Darkara" is a must-have for any teen craving an accessible, fast-paced fantasy novel.